The Build-Zone Code of Conduct for Home Builders [the “Code”] is applicable to all New Homes registered for a Build-Zone New Home Warranty on or after 1st June 2016. The Code has been established in order to ensure that Home Builders comply with standards of best practice when providing services to Home Buyers before, during and after the construction and sale of a New Home. are given details of how to access speedy, low cost Dispute resolution services. All Build-Zone registered Home Builders must agree to comply with the Code, and to be subject to disciplinary and sanctions procedures if they are found to be in breach of the requirements of the Code. In the event of a Dispute or Complaint by the Home Buyer regarding the Home Builder’s failure to comply with the Code requirements, a Mediation Process can be facilitated by Build-Zone. An independent Alternative Dispute Resolution Service, binding on both parties, is available if Mediation fails to resolve the Home Buyer’s Complaint or Dispute. The Code is not intended to enforce the rights of a Home Buyer in matters relating to the New Home Warranty. If a complaint or claim relates to the Warranty cover, the Home Buyer should refer to the Claims of Complaints procedures in the New Home Warranty Policy Wording. A person or company used by the Home Builder to deal with any matter relating to the New Home on their behalf. An adjudication service facilitated by an Independent Third Party subject to costs and award limits, where the decision is binding on both parties. Building Regulations The Building Regulations are statutory instruments in the United Kingdom that seek to ensure that the requirements set out in the relevant legislation are carried out. The New Home constructed by the Home Builder must obtain Building Regulations approval prior to the issue of a Certificate of Insurance confirming post-Completion cover for the New Home Warranty. For the purpose of this definition, Building Regulations is deemed toinclude Building Standards (Scotland). Certificate of Insurance The Certificate issued by the Scheme Administrator to the Home Buyer confirming Warranty cover for the New Home following issue of the Certificate of Approval. The Code herein described which establishes a number of requirements and expectations of the Home Builder to act in a fit and proper manner when constructing, marketing, selling and maintaining a New Home which is subject to a Contract between the Home Builder and Home Buyer. Builders provision of, or failure to provide, a service which forms part of the Contract or the Code, which is notified to the Home Builder prior to the expiry of the Defects Insurance Period but which does not relate to the Home Builders obligations under the New Home Warranty. Completion The date the New Home is practically completed evidenced by the provision of a Building Control Completion Certificate or Final Certificate or Statement of Practical Completion issued to the Home Builder by an Approved Inspector or Local Authority Building Control Body. Contract The contractual agreement entered into between the Home Builder and the Home Buyer in respect of the sale/purchase of the New Home. Failure to follow the standards within the Building Regulations and Building Standards or associated guidance does not in itself amount to a Defect, as it may be possible to meet the recommended performance in other ways. Failure to follow the Technical Standards as set out in the Build-Zone Technical Manual constitutes a Defect. For any New Home which has been converted, refurbished or renovated the definition of Defect shall only be deemed to be applicable to the Works constructed or installed by the Home Builder as part of the conversion, refurbishment or renovation. Defects Insurance Period The Defects Insurance Period is the period commencing on the date specified on the Certificate of Insurance, usually the date of Sale Completion to a Home Buyer, ending 2 years thereafter, during which time the Home Builder is responsible for rectifying Defects notified by the Home Buyer under the terms of the New Home Warranty and responsible for further matters under the terms of the Code. Deposit A non-refundable deposit paid by the Home Buyer to the Home Builder at exchange of Contracts to demonstrate the Home Buyer’s intention to buy and to reserve the New Home. Dispute A disagreement between the Home Buyer and Home Builder regarding the Home Builders provision of, or failure to provide, a service which forms part of their obligations under the Code, notified to the Home Builder prior to expiry of the Defects Insurance Period. Home Builder The Home Buyer is the first beneficiary of the Build-Zone New Home Warranty. The first owner of the New Home which is the subject of such insurance acquiring a freehold or leasehold interest in the New Home whose interest is noted on the Certificate of Insurance. The Home Buyer and subsequent homeowners benefit from the services of the Home Builder under the terms of the Code for matters notified to the Home Builder prior to expiry of the Defects Insurance Period. Home Buyer The Home Buyer is the first beneficiary of the Build-Zone New Home Warranty. The first owner of the New Home which is the subject of such insurance acquiring a freehold or leasehold interest in the New Home whose interest is noted on the Certificate of Insurance. Initial Certificate The Certificate issued by the Scheme Administrator signifying the preCompletion insurance cover afforded to the Home Buyer and agreement to the provision of the insurance cover set out in the New Home Warranty subject to receipt of a Certificate of Approval for the New Home following Completion. Insurer The Company or Lloyd’s Syndicates specified on the Certificate of Insurance relating to the Warranty for the New Home. Mediation A resolution process whereby an independent Chartered Building Surveyor or suitably qualified professional is appointed by the Code Sponsor in an attempt to resolve a Dispute between the Home Buyer and Home Builder relating to the provision of services under the terms of the Code. New Home The property described in the Certificate of Insurance as defined by the New Home Warranty. New Home Guide A document produced by the Home Builder providing general advice and guidance to the Home Buyer regarding the features, services, appliances etc of the New Home. (“Warranty”) The insurance policy specifying the insurance cover provided by the Insurers. Professional Advisor A Third Party appointed by the Home Buyer to act for and on behalf of the Home Buyer in respect of the purchase of a New Home or in respect of a Complaint or Dispute brought against the Home Builder. Reservation Agreement A written statement of intent between the Home Builder and Home Buyer to buy and sell a New Home (subject to Contract, and whether or not a fee is paid). Sale Completion The date confirming the legal completion of the first purchase of the New Home by the Home Buyer. In respect of the purchase date of New Homes in Scotland, ‘legal completion’ refers to the Date of Entry. Scheme Administrator Sennocke International Insurance Services Limited trading as Build-Zone who administers the Warranty and Code from 6 Pembroke Road, Sevenoaks, Kent TN13 1XR, Company Registration Number 02489110. Snagging Elements of the New Home which are unfinished or faulty at the time of Completion which the Home Builder has agreed to complete. Specification The detailed description of the New Home, which should include details of the materials used, room sizes, finishes, fixtures and fittings. Technical Audit The process by which the Technical Auditor ensures that the Home Builder designs and constructs the New Home according to the Build-Zone Technical Standards. Technical Auditor The party appointed by Build-Zone and managed by Build-Zone Survey Services Limited, a wholly-owned subsidiary of the Scheme Administrator, to undertake the Technical Audit. Technical Manual The document which contains the Technical Standards. Technical Standards The standards of good practice and compliance detailed in the Technical Manual which the Home Builder agrees to comply with in order for the New Home to be considered suitable for the provision of a Warranty. Vulnerable Consumer A Home Buyer whose ability to make a sound decision is impacted for any number of reasons, including but not limited to vulnerability due to their age, infirmity, native language, a registered disability or a learning difficulty, due to high stress or illness and reasonable naivety relevant to comprehension and understanding of the Contract to purchase a New Home. Warranty See New Home Warranty. Work/Works The Work relevant to the construction or rectification of a newly built, renovated, converted or completed project in accordance with the building contract, good practice, all relevant and applicable industry standards, codes of practice and relevant Building Regulations. The Code applies to any New Home registered for a Build-Zone New Home Warranty on or after 1st June 2016. The Code is applicable until the expiry of the Defects Insurance Period. Second hand properties (e.g. homes taken by the Home Builder in part exchange). New build properties sold by a Home Builder not registered with the Code. Any property remaining under the ownership of the Home Builder. Any property acquired by social landlords for renting. Any property acquired by corporate bodies, partnerships or commercial landlords. Any property built by a self-builder or under contract between a builder and an individual for their own occupation. Any matter which is covered by the terms of the New Home Warranty. Any matter which is covered by other insurances, guarantees, warranties or indemnities. Any matter where the Home Buyer has not or does not expect to suffer a loss, whether physical, financial or psychological, relating to a service which would be expected from the Home Builder. Any party who is not subject to the Contract to purchase the New Home, unless appointed to act for or on behalf of the Home Buyer or Home Builder in relation to the Contract or in relation to a Complaint, Dispute, Mediation or the Alternative Dispute Resolution Service. Any matter which would be better dealt with by another dispute resolution or ombudsman scheme should be referred to the relevant organisation. In these cases, these schemes will take precedence over the Code and its dispute resolution provisions. Nothing in this Code affects Home Buyers’ existing legal rights. This will enable the Code Sponsor to assess Home Buyer satisfaction and Home Builder compliance with the Code. An Annual Report on the effectiveness and operation of the Code will be presented to the Trading Standards Institute for review under the Consumer Codes Advisory Process on or after 1st June, and will also be published on the Build-Zone website. The Annual Report will provide details of performance, benefits and consumer satisfaction, and will additionally consider any changes in market conditions including regulatory amendments affecting homebuilding in the UK including revisions to consumer legislation. Compliance with the Code is mandatory for all Home Builders registered with Build-Zone, and any Home Builder who registers with Build-Zone must agree to comply with the terms of the Code. Home Buyer or prospective Home Buyer or their representative. The Home Builder must display a copy of the Code in any show home or at any sales office or other area related to the sale of the New Home. Hard copies of the Code must be produced on A4 portrait paper. The Code can also be distributed by email as a PDF document. Any requests for braille, audio recordings, and translations into other languages or other formats should be made to the Code Sponsor. The Code Sponsor will engage to meet all reasonable requests from a Home Buyer or their representatives, which are not the responsibility of the Home Builder. The Home Builder must provide the Home Buyer with written details of the Code, specifying what cover is provided, what is excluded, and the period the Code is effective. Details should be provided of the Complaint and Dispute procedures, as well as how to access Mediation and the Alternative Dispute Resolution Service. Employees and Agents of the Home Builder must be trained according to their role in dealing with Home Buyers. They must be aware of the provisions of the Code in order to make the Home Buyer aware of their rights under the Code. Employees and Agents of the Home Builder must be made aware of their responsibility not to engage in high pressure selling techniques. Employees and Agents of the Home Builder must be trained to recognise and cater for the needs of Vulnerable Consumers (see Section 5.4 ‘Vulnerable Consumers’). 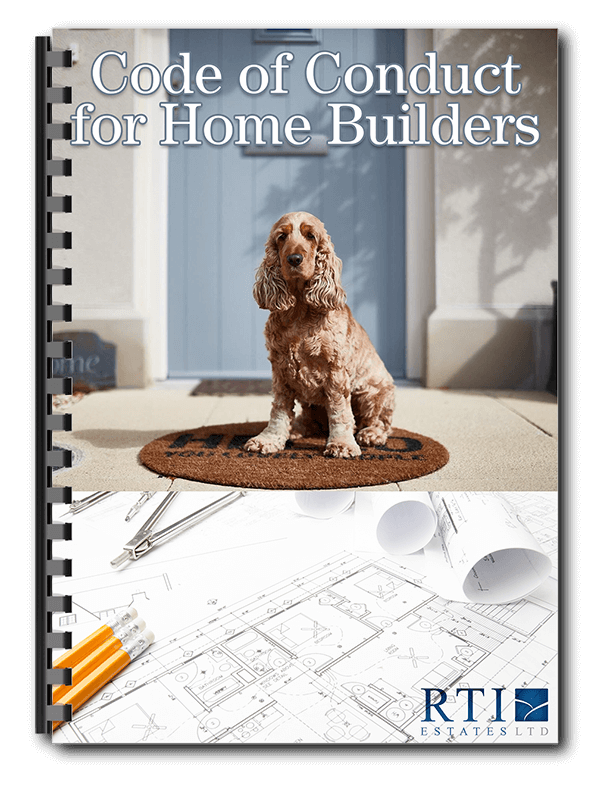 The Home Builder must be able to show, via records of attendance, training programmes, professional qualifications, express statements or similar, that employees and Agents of the Home Builder have been trained to understand the terms of the Code. At the request of the Home Builder, the Code Sponsor will undertake appropriate training sessions for the employees of the Home Builder. Home Builders must demonstrate that their practices, including operations, sales and contracting/construction, are lawful. This includes, but is not limited to, evidence of Employers’ and Public Liability Insurances. The Home Builder must ensure that all employees and Agents involved in the sales process understand their responsibility to identify and support Vulnerable Consumers, and that the necessary arrangements are made to provide advice and assistance appropriate to their needs. If a potential Home Buyer declares vulnerability (e.g. blindness or language barrier), the Home Builder must consider the possible effect of that vulnerability on the proposed transaction. If no vulnerability is declared by the potential Home Buyer, but it becomes apparent that there may be vulnerability, the Home Builder should seek clarification from that person and/or their representative. Enquiries must be considerate and unlikely to offend or to be interpreted as discriminatory. If the Home Builder is advised of, or perceives there to be vulnerability, they could also consider seeking further information from an appropriate organisation specialising in that vulnerability. The Home Builder must take the Vulnerable Consumer’s specific needs into account in any information or guidance they are given. Further sources of information about vulnerability may be found in Section 6 ‘Useful Information’. All sales and marketing material and activity used to advertise the New Home must be clear and truthful, with no misleading information regarding the size, price, specification or other details of the property. Any other relevant regulations or legislation, such as the Consumer Rights Act 2015 must be complied with. The New Home must be advertised with an accurate Specification including a clear description of prices, fees and the costs of all proposed services. Giving misleading information regarding the size, specification or other details of the New Home. Offering financial incentives in return for an immediate decision. Implying a future price increase. The Code must not be advertised with the New Home unless the New Home has been registered with Build-Zone for the purpose of obtaining a New Home Warranty and an Initial Certificate has been issued. The Home Builder must give accurate and reliable information to the Home Buyer regarding the Build-Zone New Home Warranty and the cover it provides. The Home Buyer must be provided with a copy of the Initial Certificate and policy wording, together with Build-Zone’s contact details. The Home Builder must provide appropriate provisions regarding Health & Safety for potential Home Buyers when visiting the New Home whilst Works are being undertaken. The site must comply with the requirements of the Construction (Design & Management) Regulations 2015 and should have a clear Health & Safety policy. The Home Builder must take account of the needs of the Home Buyer visiting the site. In particular the needs of disabled visitors should be considered, to ensure there is adequate provision for access and escape. Personal Protection Equipment, Health & Safety briefings and any other relevant guidance should be provided as appropriate. Suitable provision must also be made regarding Health & Safety for potential Home Buyers when visiting a show home, the Home Builder’s office or similar. The Home Builder must provide appropriate guidance on the regulations relevant to Health & Safety for additional Works that may be undertaken to the New Home by or on behalf of the Home Buyer, e.g. New Homes completed to shell & core by the Home Builder where the Home Buyer separately undertakes completion works. The Home Builder must make appropriate provisions regarding Health & Safety for Home Buyers following Completion (before or after Sale Completion) where remedial, Snagging or other additional Works are to be undertaken to the New Home by the Home Builder. Information explaining the full terms of the proposed Contract. A full Specification for the New Home. Details of any management services and organisations to which the Home Buyer will be committed and their estimated cost. Details of any other services and costs to be provided to or incurred by the Home Buyer. Full details of the Home Builder, including full legal name, contact name and details, address and legal status. Details of any Third Party representing the Home Builder, such as a Conveyancer, Solicitor or Selling Agent, including full legal name, contact name and details, address and legal status. Details of how to make a Complaint under the terms of the Code. A brochure or plan showing the layout, size, appearance and plot position of the New Home. An estimate of the expected Completion date. An alteration to the New Home that directly or materially affects the value. Excessive or unreasonable misrepresentation of features or amenities. Excessive or unreasonable delay in construction of the New Home. The Home Buyer must be made aware that cancellation and withdrawal rights cease following Sale Completion. The Home Builder must advise the Home Buyer that the Contract to purchase a New Home should only be considered with proper legal advice and representation. The Home Builder must not restrict the Home Buyer’s choice of legal representative. The Home Builder must be aware of and cater for the additional requirements of Home Buyers that can be classed as Vulnerable Consumers. Vulnerable Consumers and their representatives must be given the right to request additional, reasonable services from the Home Builder, to ensure they are fully informed when considering the Contract (see Section 5.4 ‘Vulnerable Consumers’). The amount of the Reservation fee. Confirmation that the Reservation fee is refundable if the Reservation agreement is cancelled, with details of the nature and extent of any administration fees which may apply. Full details of the New Home (including property type, plot number etc.). How long the price and the Reservation Agreement remain valid. Details and estimated cost of any management services that the Home Buyer must pay for. Details of how the Home Buyer can include in the Contract any spoken statement that is to be relied upon. While the Reservation Agreement is in force, the Home Builder must not enter into a new Reservation Agreement or sale agreement with another customer on the same New Home. Unless the Home Buyer has paid the Reservation fee by credit card (and the fee is over £100), the Home Builder must hold the Reservation fee in a separate statutory trust client account designated for holding such fees. Home Buyer. The Reservation period may be extended by mutual agreement between the Home Builder and Home Buyer. If the deadline date is not extended and Contracts have not been exchanged, the Reservation Agreement automatically expires. The Reservation fee must be refunded in full if the Home Buyer wishes to cancel the Reservation for any reason within 7 working days of signing the Reservation Agreement. The Pre-Contractual Information reviewed by the Home Buyer and included in the Reservation Agreement must form the basis of the Contract. Where there are any changes in terms, the Home Buyer must be given the opportunity to fully consider the amended Contract. The Home Buyer’s cancellation rights after payment of Deposits and / or following completion of a Reservation Agreement. Details of where and how a Deposit will be used and safeguarded. The Home Buyer’s cancellation rights once a Contract has been entered into. The Home Buyer’s rights to receive details of any change in the Specification of the New Home between Contract exchange and Completion. Details of all costs for the New Home including services, charges, maintenance fees and how each cost has been calculated including clearly stated taxes at prevailing rates where relevant. Expected delivery and completion dates, including Completion of the New Home and anticipated Sale Completion. Details of the Home Buyer’s rights arising out of failure of the Home Builder to meet specified delivery and completion dates. Details of the Home Builder’s Complaints procedure, together with details of the rights of the Home Buyer under the terms of the Code. To avoid Disputes over spoken statements, immediately before exchange of Contracts the Home Builder must ensure that the Home Buyer, through their legal representative, states in writing what spoken statements they are relying on when entering into the Contract. The Home Buyer must be allowed sufficient time to fully consider the proposed Contract. The exchange of Contracts must be supervised by professionally qualified Third Parties. The Home Builder holds the Deposit in a separate statutory trust client account which is designated for the holding of Deposits and cannot be accessed by the Home Builder until Sale Completion. Evidence must be provided to the Home Buyer. The Deposit is protected by a bond or similar security and evidence of this has been provided to the Home Buyer. The Deposit is protected in full by the Warranty and evidence of this has been provided to the Home Buyer. at any time prior to Sale Completion. The Home Builder cannot limit their liability to fully reimburse the Deposits of Home Buyers unless specifically allowed for by the Contract. If a change is made to the design, construction or materials to be used in the New Home that will materially alter its size, appearance or value, the Home Builder must formally consult the Home Buyer and obtain their written agreement to any changes. If the Home Buyer considers the alterations unacceptable, they have the right to cancel the Contract and obtain a full refund of the Deposit, with no deductions or withholding of any fees. Minor changes that do not significantly alter the size, appearance or value of the New Home must be notified to the Home Buyer, with the advice that they may wish to consult their legal representative as to the effect of those changes on the Contract. However the Home Buyer’s agreement is not required by the Home Builder in respect of such changes. Rights of cancellation and refund. Estimated impact on the date the New Home will be finished and available for occupation. The Home Builder or Home Builder’s Agent must provide Build-Zone with confirmation of the date of Sale Completion in order for Build-Zone to issue the Certificate of Insurance in respect of the Warranty. A copy of the Building Control Completion Certificate. The Certificate of Insurance and Policy Wording for the Warranty where available, or an explanation as to why they are not available. A New Home Guide giving full details of appliances, services etc. Details of any guarantees and warranties applicable to the New Home or its contents. Details of the Home Builder’s Complaints Procedure. Details of how to access the Code’s Mediation and Alternative Dispute Resolution Service. Full details of the after sales service offered by the Home Builder. This should include confirmation of the length of the after sales service, and contact details for the Home Builder or their Agent during this period. At Sale Completion, the Home Builder must make the Home Buyer aware of their right to require the Home Builder to complete or rectify any incomplete or faulty items (Snagging). The Home Builder must agree with the Home Buyer items that require further Works, and the Home Builder must complete Snagging Works within a reasonable period acceptable to the Home Buyer. The Home Builder, or a Third Party acting for the Home Builder, such as a Managing Agent, must produce a New Home Guide which is specific to the New Home. The Home Builder must provide the New Home Guide to the Home Buyer. The New Home Guide must provide general advice and guidance regarding the New Home, including: operating white goods and appliances; locating service boxes; contact details for Utilities providers; etc. The Home Builder is responsible for the content of the New Home Guide and any errors or omissions, and must ensure that all the information is clear and accurate. During the after sales period for matters which relate to the New Home or the New Home Guide. The Home Builder must provide the Home Buyer with up to date details of how, when and where the Home Builder can be contacted. A Complaint must relate to the provision of services by the Home Builder, which are not covered by the terms of the Warranty. If a Complaint relates to matters covered by the Warranty, the Home Buyer should refer to the New Home Warranty Policy Wording and follow the appropriate Complaints Procedure. The Home Builder must provide clear information on how the Home Buyer can make Complaints, who to and in what format, such as verbally over the phone, by email, in writing or in person. When a Complaint has been made, the Home Builder must promptly acknowledge the Complaint and confirm to the Home Buyer how their Complaint will be responded to. A suitable timetable must be provided to the Home Buyer, during which time the Complaint can be investigated before a response is made. The Home Builder must provide clear, accurate and reasonable responses to the Home Buyer. The Home Builder must provide clear information on how the Home Buyer can access Mediation and the Alternative Dispute Resolution Service. In the event that the Home Buyer disagrees with the Home Builder following a Complaint, the Code will treat any further correspondence between both parties as a Dispute. If a Dispute cannot be settled between both parties, the Home Buyer is entitled to raise the Dispute with Build-Zone. The Home Buyer can choose to escalate a Complaint or Dispute to Mediation and / or the Alternative Dispute Resolution Service. However, Mediation cannot be undertaken following a decision made under the terms of the Alternative Dispute Resolution Service unless the subject matter of the Complaint or Dispute is separate from the matter considered by the Alternative Dispute Resolution Service facilitator and the Home Builder has had the opportunity to respond to the Complaint or Dispute. If the Home Buyer appoints a Professional Advisor, the Home Builder must treat the Professional Advisor as if they were the Home Buyer. The Professional Advisor shall be subject to the same rights under the Code as the Home Buyer, subject to those rights only being used for and on behalf of the Home Buyer. The Home Buyer has the right to deal with the Home Builder solely through the use of a Professional Advisor and the Home Builder must contact the appointed party only, unless permission is provided to the contrary. In the event that a Complaint or Dispute is brought before Mediation and / or the Alternative Dispute Resolution Service, the Home Builder must contact the appointed party acting for the Home Buyer only, unless permission is provided to the contrary. within a 6 month period following the provision of a written decision by the Home Builder. The Mediation service will be free of charge to both parties. The Home Buyer and Home Builder will be notified of the outcome of the Mediation within a 45-day period following the provision of appropriate evidence, unless otherwise agreed in writing by BuildZone and both parties. The Mediation service will be undertaken by a Chartered Industry Professional (Qualified with designations from CIOB, RICS, ICE, IStructE or other Body as appropriate) on the instructions of Build-Zone. The outcome of Mediation is not legally binding on either party. The outcome of Mediation does not affect the rights of the Home Buyer to escalate the Complaint or Dispute to the Alternative Dispute Resolution Service. The outcome of Mediation does not affect the statutory rights of the Home Buyer to pursue legal action outside the Code. The terms, conditions and processes to be followed by the Alternative Dispute Resolution Service will be agreed by the Centre for Effective Dispute Resolution (CEDR), which is independent of the Home Builder and Code Sponsor, prior to the appointment of an Adjudicator. The case registration Fee for Adjudication for the Home Buyer is £100 plus VAT. The Fee for Adjudication with early settlement for the Home Builder is £250 plus VAT. The Fee for Adjudication without early settlement for the Home Builder is £500 plus VAT. Awards for emotional distress and / or inconvenience are subject to a maximum award of £1,000. Awards can include reimbursement of the Home Buyer’s case registration fee of £100. The maximum value of any award will be 25% of the contract price of the New Home subject to a maximum of £50,000 (inclusive of VAT) in the aggregate for all awards. The Home Builder may be ordered to satisfy and comply with a performance award that will be advised by the Adjudicator, e.g. where the Home Builder must carry out Works to the New Home. The Home Builder may be ordered to satisfy and comply with any combination award, i.e. a combination of reimbursement of financial loss, compensation for emotional distress and inconvenience (subject to the limits above), and carrying out Works to the New Home. The Home Builder may be referred to the Disciplinary and Sanctions Panel following the decision of the Adjudicator. All awards made by the Alternative Dispute Resolution Service are INCLUSIVE OF VAT. Dispute Resolution Service. A new Complaint raised during the Alternative Dispute Resolution Service process which the Home Builder has not had the opportunity to respond to will not form part of the Alternative Dispute Resolution Service. Under the terms of their registration with the Code, the Home Builder is required to honour any award made against them under the Alternative Dispute Resolution Service. The Adjudicator’s decision cannot be appealed against. It can only be accepted or rejected by the Home Buyer. Should the Home Buyer reject the Adjudicator’s decision this does not affect their statutory rights to take further legal action outside the Code against the Home Builder. The Home Builder can be referred to the Disciplinary & Sanctions Panel following the outcome of Complaints, Disputes, Mediation and the Alternative Dispute Resolution Service. The Disciplinary & Sanctions Panel comprises 3 professionals who have been appointed by the Code Sponsor. The members of the Panel will comprise a Local Authority Trading Standards Representative, an independent Construction Industry Professional and an independent Insurance Professional. The Panel will be chaired by the Local Authority Trading Standards Representative. Decisions made by the Panel will be based on a majority opinion. The Disciplinary & Sanctions Panel will have the power to enforce, through legal means, any failure of the Home Builder to comply with the decision of the Alternative Dispute Resolution Service. The Disciplinary & Sanctions Panel will have the power to sanction Home Builders for any breach of the terms of the Code. Option 1: Written warnings regarding the specific breach, including a training programme to be undertaken, at the direction of a party to be appointed by the Panel and at cost to the Home Builder, in order to assist the Home Builder in rectifying the breach. Option 2: A financial penalty or fine, equivalent to reasonable costs which were incurred by the Home Buyer and / or Code Sponsor as a result of the breach, awarded to each party for their respective losses. Option 3: The Code Sponsor being instructed to no longer provide Code or Warranty services to the Home Builder or to any party associated with a Director or Senior Manager of the Home Builder, either at present or in the future. The imposition of a ban on the Home Builder will either be defined by a period of time, or will be indefinite. Where a Home Builder is referred to the Disciplinary & Sanctions Panel on a second occasion, the Panel will only consider Option 2 or 3 above. Where a Home Builder is referred to the Disciplinary & Sanctions Panel in respect of a breach of the Code relating to a Vulnerable Consumer, the Panel will only consider Option 2 or 3 above. The Disciplinary & Sanctions Panel may share details of sanctioning with other Code Sponsors and New Home Warranty Providers who operate a similar Code. Please note that consumer questions and complaints should be referred to Citizens Advice. https://www.gov.uk for access to information and advice on disability and mental health issues www.ableize.com which is run by disabled people, providing links to local and national support and advice groups.